50 years ago, the signature of the Évian Accords on March 19, 1962 signaled the end of the Algerian war and led to the independence of Algeria on July 5, 1962. In the Gaullist tradition of popular sovereignty, voters in metropolitan France were to ratify the accords in a hastily-organized referendum on April 8 while voters in Algeria – including, on paper, French citizens of Algeria – were to formally decide on their independence in a referendum on July 1. French voters on April 8 ratified the terms of the Évian Accords with 90.8% support and only 25% abstention. In Algeria, the result was an even bigger blowout: 99.7% voted in favour of Algerian independence, which was recognized by France on July 3 and proclaimed officially on July 5. Already in January 1961, Charles de Gaulle had received popular approval through referendum of a rather vague program concerning self-determination in Algeria. de Gaulle had already privately decided that the sole solution to the Algerian crisis was Algerian independence, a fact which he recognized as early as 1959/1960. In reality, de Gaulle had never cared much for Algeria and his Algerian policy was first and foremost pragmatic. Following the 1961 referendum on self-determination, the French government and the Algerian nationalists (the GPRA and FLN) began talks in Évian, which broke down before re-opening in 1962. The two main blockage points between the French government and the GPRA were the rights of Europeans residing in Algeria and the control of newly-discovered petroleum resources in the Sahara. France wanted some sort of “guarantees” concerning the rights of the European (white) residents of Algeria – the pieds-noirs, a population numbering about a million people and 10% of Algeria’s population. Similarly, French strategic interests were concerned about the control of French military bases (used for nuclear testing) and the ownership of the Sahara’s black gold. In the end, the Évian Accords (on paper) set out rights guarantees for the Pieds-Noirs during a three year period, while also allowing France to continue secret uses of its military bases for nuclear testing for 15 years and advantages in the control of the Sahara’s oil resources. Following Algerian independence, rights guarantees for European residents in Algeria were quickly forgotten: on the very day of Algeria’s independence, hundreds of French civilians were massacred in Oran. The Évian Accords included a cease-fire and the organization of a self-determination referendum in Algeria in a three-month window to be held a minimum of three months after the signature of the treaty. In the period between the signature of the Évian Accords and the self-determination referendum, France retained sovereignty over Algeria through an interim executive and high commissioner representing France. The opponents of Algerian independence, the so-called ultras who had formed the underground Organisation de l’armée secrète (OAS) in 1961 which staged terrorist attacks with the aim of preventing Algerian independence. Following the Évian Accords, the OAS’ last hope was to prevent the timely organization of the self-determination referendum in Algeria. A mix of bombings, terrorist attacks and sniper shootings by the OAS with the aim of harassing the FLN into breaking the cease-fire and destroying the accords made the period between March and June 1962 one of the bloodiest periods in the war’s history. However, the OAS leader, General Raoul Salan was captured in April 1962 and the OAS compelled to a cease-fire in June. The OAS or the cause of l’Algérie française never found a strong base of support with the metropolitan French population, which was in large majority exhausted of the bloody conflict and which harboured no sympathies for people they judged to be reactionary colonialists who were keeping them hostage in a futile conflict. However, the OAS and their cause had much more institutional support than popular support. A good number of government deputies from the UNR and the ‘moderates’ (CNIP) were favourable to l’Algérie française. Charles de Gaulle’s own Prime Minister, Michel Debré, was a not-so-secret opponent of Algerian independence. The OAS had received the backing of former UNR cabinet minister Jacques Soustelle and former MRP Prime Minister Georges Bidault amongst others. In November 1961, 80 deputies had voted in favour of the so-called amendement Valentin, which was widely interpreted as being dictated by Salan and the OAS. The ’80’ included CNIP deputy Jean-Marie Le Pen, Compiègne mayor Jean Legendre, ex-SFIO deputy Léon Delbecque, Perpignan mayor Paul Alduy, Pascal Arrighi, former Prime Ministers André Marie and Georges Bidault, and Tours mayor Jean Royer. On April 8, voters in metropolitan France ratified by a huge 9-to-1 majority the contents of the Évian Accords. The referendum was hastily organized, in part to prevent the organization of serious opposition, and the rules set up to keep French citizens in Algeria – constitutionally eligible to vote – from voting in the referendum. Nearly 17.9 million voters voted in favour of ratifying the accords, with only 1.8 million voting against. 24.6% of registered voters abstained while 4% (1.1 million) cast white or null votes. In the 1961 self-determination referendum, opposition to the government’s vague Algerian agenda reached 25% – but largely because the French Communist Party (PCF), hostile to the government but a supporter of Algerian independence, had instructed its supporters to vote against. However, in April 1962, all political parties – the Gaullist UNR, the Socialists, the PCF, the MRP and the Radicals – supported a favourable vote. The CNIP gave no indication, while the left-wing PSU called in favour of a white vote (hence the high number of such ballots). The only source of opposition was to be the far-right, the nationalist sectors which had sympathy for the OAS and remained loyal to the cause of French Algeria. The overwhelming victory of the yes vote on April 8 (91% of valid votes) represented two or three things. Firstly, and most importantly, a profound desire for peace and tranquility after years of war and recent terrorist attacks. In metropolitan France, by 1962, the war was no longer seen as being about upholding the French nation in Algeria and defending the French empire, but rather as a bloody futile conflict which stole the lives of countless young men from villages and small towns a across France. The pieds-noirs were not seen as the vanguards of empire, but rather as reactionary colonialists who had held the country hostage with their terrorist actions. Secondly, especially for Gaullist voters, support for Charles de Gaulle. In 1962, his support far surpassed that of the Gaullist party, the UNR, as his success in the face of cohesive left-right opposition in the November 1962 referendum proved. Following Algerian independence, the pied-noir exodus to France was 10 times bigger than what the government had predicted. Official predictions believed that some 300,000 or so would move back to France but that the rest would opt to stay in Algeria. Over a million moved to France, only a handful remaining in independent Algeria. The massive exodus created a housing crisis in the regions where they settled (PACA, Languedoc-Roussillon, Midi-Pyrénées, Aquitaine, Corse) and the rapatriés often faced discrimination or exclusion once they arrived. The communist left was particularly violent, but they were generally perceived by most as being backwards, racist, violent, less educated colonialists who had exploited the Algerian indigenous population. Let us stop for a moment on the 1962 referendum, in order to analyse who voted against the Évian Accords now that we know why people voted in favour. The map to the right shows the percentage of no votes by department in the Évian referendum. The bulk of opposition was concentrated along a sort of line stretching from Bordeaux to the Italian border in the Alpes-Maritimes, following the Garonne valley and the Mediterranean coast in Provence. Opposition was highest in the Gironde department (14.4%), Tarn-et-Garonne (14.3%) and in Paris (14%). Other sizable opposition was found in the Lot-et-Garonne (13.3%), Gers (13.8%), Haute-Garonne (12.7%), Tarn (12.3%), Hérault (11.8%), Bouches-du-Rhône (13.4%), Vaucluse (13.8%), Var (13.1%), Alpes-Maritimes (13.4%) and Corse (12.1%). The only departments with similarly high opposition lying outside this region were the Indre-et-Loire (12.2%), Indre (11.9%) and Seine-et-Marne (11.9%). The pattern of opposition to Évian in the south of France, following the Garonne valley and Mediterranean coast, resembles the pattern of support for 1965 far-right candidate Jean-Louis Tixier-Vignancour who won his best results in this region. The reason is, of course, fairly simple: these were the regions which attracted the most pieds-noirs who settled along the coast or in urbanized areas (Bordeaux, Toulouse, Marseille, Toulon, Orange, Lyon). The Pyrénées-Orientales also received a large pied-noir population, though apparently post-exodus since opposition to Évian was only 8.5% in 1962. Lyon (Rhône) and the high-growth inner suburbs (and new towns) in the Paris outskirts also received a large pied-noir population. 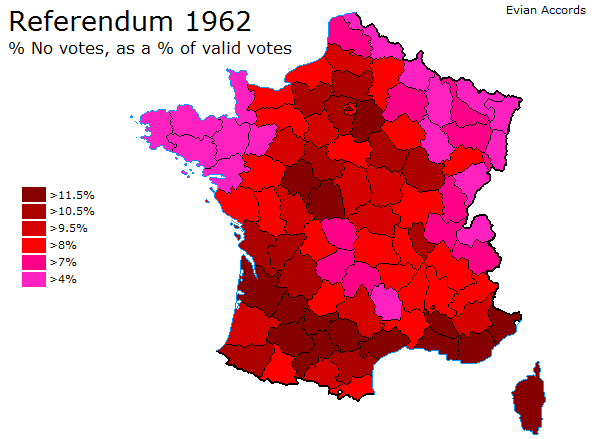 The 1962 referendum was held prior to the mass exodus, but a smaller share of pieds-noirs had already moved to France from Algeria since 1961 and there were, in addition, European settlers from Tunisia and Morocco who moved to France following the independence of both of these countries. It is of course hard to quantify the percentage of the population of each department which was of North African ‘ancestry’, especially in 1962. Why the pieds-noirs voted against Évian does not merit a detailed explanation. There was a deep, profound sentiment in the pied-noir population which still endures to this day that they were ‘betrayed’ by the French government, especially by the ‘traitor’ Charles de Gaulle who had exclaimed, in 1958, vive l’Algérie française! Évian and the exodus turned the pied-noir community into an irremediably anti-Gaullist electorate. In 1965, Tixier-Vignancour had endorsed François Mitterrand over Charles de Gaulle in the runoff. Jacques Soustelle backed Jean Lecanuet in 1965 and Alain Poher in 1969. Valéry Giscard d’Estaing was the favourite of the traditional far-right in 1974, especially over Jacques Chaban-Delmas. The pied-noir explanation alone is a large part of the explanation, but pre-exodus it cannot account for a million voters and 9% of valid votes. Understandably given the low academic interest for the results of this plebiscite, there has been little if anything of note written about the results of the referendum and the electorates touched by the no vote. The following explanations take the form of assumptions and theories, which are not backed up by much academic literature but only by personal interpretations. Paris placed third in terms of highest no votes, which is the first sign that the pied-noir explanation cannot explain it all away. Paris probably did not receive many pied-noir settlers, especially prior to July 1962. It is unfortunate that we do not have results down to the constituency level for this election, but the 1965 presidential election – specifically Tixier-Vignancour’s support – may give us indications about 1962. In 1965, Tixier-Vignancour’s support in Paris had been heavily concentrated in the most bourgeois upper-class neighborhoods on the west side of the city. He took over 8% of the vote in the very affluent 8th and 16th arrondissements, and over 7% in the equally bourgeois 7th and 17th arrondissements. Prior to the appearance of the FN in 1984 (and even then…) the far-right’s base in Paris had been with a comfortable, very affluent, traditional upper-class segment of society which had certain aristocratic roots and harboured sympathies for traditionalist causes such as that of the Action française. It is likely that the cause of French Algeria found some supporters in the Parisian upper bourgeoisie, expressed through a surprisingly large vote against Évian. This 60s-70s phenomenon of far-right inclination amongst the upper middle-classes and the traditional bourgeoisie was largely a Parisian thing, but it also found expression in other large urban areas, including Lyon, Marseille, Bordeaux, Rouen, Le Havre or Lille. As in 1984, Tixier-Vignancour tended to perform better in the more right-leaning affluent neighborhoods of large urban areas than the more left-wing working-class areas. This was not a particularly solid base for the far-right, in fact it only appeared in large numbers in 1965 and 1962. There existed some kind of natural bridge between far-right sympathies, sometimes expressed electorally, and traditional support for the ‘moderates’ (CNIP). The CNIP had a similar appeal to these types of voters, which harboured conservative views on matters such as French Algeria among other things. It is quite possible that in some larger urban areas, such as Paris or Lyon, some ‘moderate’ voters opted for a negative vote on Évian through support or understanding of the OAS and the nationalist cause of French Algeria. There was an interesting outcrop of opposition in the Touraine – particularly in Indre-et-Loire (12.2%), Indre (11.9%) and Loir-et-Cher (11.5%). There is not much record of a large pied-noir population in this region, and besides Tours there are not many large urban areas with a large bourgeois electorate. Poujadism had done well in some of this region and in 1965, Tixier’s map revealed a similar outcrop of support in these departments. In this region, especially Tours and Indre-et-Loire, the French Algeria inclinations of conservative icon and Tours mayor Jean Royer (DVD) had some impact in stimulating a larger no vote. Boosted by Royer’s traditionalist influences, the local petite bourgeoisie and traditional middle-classes might have been inclined towards a no vote. A similar explanation might work for the Oise (11.5% no), where Compiègne mayor Jean Legendre (CNIP) had voted in favour of the ‘OAS amendment’. In the Côte-d’Or (11.1% no), perhaps the influence of viscerally anti-FLN CNIP Senator Roger Duchet and of the fairly conservative Dijon mayor Félix Kir (who had called for abstention himself) played a role in the department’s above-average opposition to Évian. In all these cases, the no vote was more the result of conservative ‘moderate’ (CNIP) voters with far-right inclinations than of any pied-noir vote. Opposition to Évian was quasi-null in Alsace, Lorraine, Champagne, the Nord, Brittany, parts of Maine and Savoie. All of these regions were more or less solidly Gaullist regions, most of them (especially Alsace or Brittany) inherited from the MRP. The Catholic departments come out pretty clearly on the map (the southern Massif Central also had very little no votes) as total dead zones for opponents of Algerian independence. Did faith have a role to play with opposition to the war, or was it Gaullism or perhaps a general isolation from the war activities? Being distant or isolated from the war theaters and the terrorist actions of the OAS perhaps solidified or intensified opposition to war which by the time of the Évian referendum had a very bad name in metropolitan France. Alsace and Lorraine are certainly not devoid of nationalist sentiments, past or present, but eastern France’s nationalism has historically tended to be driven by opposition to Germany than any imperialist or colonialist ambitions or sentiments. 50 years later: A Pied-Noir vote? 50 years after the independence of Algeria and the pied-noir exodus, how large is the “the pied-noir electorate” and what is its electoral impact? The traditional view is that the pied-noir community has retained a strong bias in favour of the far-right and hostility towards Gaullism and skepticism towards the left. This view is not too bad as far as generalizations go. It is often assumed that the FN’s strong support in PACA and Languedoc-Roussillon can be explained away, almost entirely, with the the large presence of the pied-noir electorate in these regions. In January 2012, the CEVIPOF in collaboration with the pollster IFOP published a short analysisof the pied-noir vote 50 years later as part of a wider series of “sociological electorates”. According to the IFOP’s research, the pied-noir community proper would number around 1.2 million voters (2.7% of registered voters) but could be expanded to as large as 3.2 million voters (7.3% of voters) using a more liberal definition to include those who have a pied-noir parent or grandparent. The weight of the pied-noir community was found to be greater, logically, in Languedoc-Roussillon (15.3%), PACA (13.7%) Midi-Pyrénées (11.2%) and Aquitaine (9.6%). We can safely conclude that while the pied-noir electorate in these regions does likely play a role in strengthening the far-right, it is only one factor with many others which explain the far-right’s above-average support in these regions. IFOP’s research also included a survey of the voting intentions of pied-noir looking ahead to next month’s presidential election. According to the study, the pied-noir vote in 2007 had favoured Nicolas Sarkozy with 31% against 20.5% for Ségolène Royal – an average vote for the right, a below average vote for the left – but Jean-Marie Le Pen, with 18%, had performed 8 points better than he did with the entire electorate. François Bayrou, on the other hand, did about 11 points worse with the pied-noir electorate (7%). In 2002, the study notes that about three out of ten pieds-noirs had voted for one of the two far-right contenders. In the perspective of 2012, the survey (conducted in October 2011 and based on a national sample of 29% for Hollande, 22.5% for Sarkozy, 19.5% for Le Pen and 15.5% for all centrist candidates) showed that Marine Le Pen led voting intentions with pied-noir voters with 28% against 26% apiece for Hollande and Sarkozy, with only 9% support for centrist candidates. Voters of pied-noir ancestry would opt for Hollande with 31% against 24% for Marine and 15% for Sarkozy. The pied-noir vote is thus not homogeneously biased in the FN’s favour either. Further demographic studies of far-right support among pieds-noirs voters, broken down by age and social class, would prove even more interesting. Still, a sizable portion of the pied-noir demographic retains a tradition of far-right support. It is likely strongest with those who have not “moved on” entirely and still remain active in association or clubs for ex-French settlers in Algeria. The demands of these clubs and associations include the official recognition by the French government that it was responsible for abandoning them in the summer of 1962 (particularly the Oran massacres, which pieds-noirs claim de Gaulle’s government turned a blind eye to) and some sort of financial compensation for the loss of their property in Algeria in 1962. There is still resentment towards de Gaulle and hostility towards the FLN and Algerian government(s). Similarly, the harkis (Muslim Algerian supporters of France during the conflict) usually demand official recognition by the state that they were “abandoned” to be massacred in summer 1962. In 2007, Sarkozy had talked about compensation and a memorial law recognizing the state’s role in the ‘betrayal’ of the pieds-noirs and harkis. None of that has happened yet. For the left, remarkable stability at low levels of support, which are not even broken by ‘red waves’ such as the 2004 and 2010 regional elections. Pieds-noirs might have opted for Mitterrand over the “traitor” in 1965, but the left has never been the first choice for most pieds-noirs. Around the time of the exodus, the Socialist mayor of Marseille, Gaston Defferre had, in not so polite terms, suggested that they go “readapt elsewhere”. The PCF, which favoured Algerian independence before anybody else, was long hostile towards the pieds-noirs. Unsurprisingly, the PCF, which held Carnoux’s constituency until 1999, always performed well below average in Carnoux. For the centre, save for the exceptional “not-so-centrist” Balladurian vote in 1995 and Bayrou’s “not-so-centrist” electorate in 2007, a general absence from the electoral game. The post-UDF centre, which we can call a “humanist Christian centre-right”, has never appealed to pieds-noirs. The Giscardian RI had some support with pieds-noirs on the back of anti-Gaullism, but Bayrou’s MRP-CDS tradition has never had a natural base with the pied-noir electorate. The right has tended to be the main rival to the far-right. Against the far-right, it can garner the support of the bulk of the first round left and centre; against the left, it can take the bulk of the far-right’s first round support (not much gaucho-lepenisme for the pieds-noirs). Chirac performed decently in Carnoux in 1995 and 2002 (in the first rounds), but Nicolas Sarkozy (43.4%) clearly took a significant amount of support from Le Pen in 2007. This is not unsurprising, given that mixed with Sarkozy’s appeal to pieds-noirs specifically he generally picked up the most FN votes in those areas, like Carnoux, where the FN vote is predominantly right-wing and fairly middle-class petit bourgeois. In the 2010 regional elections, the UMP’s resistance was surprisingly strong. Perhaps there was a small ‘boost’ for Thierry Mariani, the UMP’s top candidate in PACA, who has been vocal on the issue of recognition and memorial laws for pieds-noirs. In legislative elections, both in 2002 and 2007, the right usually performs very strongly. There is likely considerable cross-over support from Le Pen voters to the constituency’s right-wing deputy since 1999, Bernard Desflesselles (UMP). The far-right has been very strong in Carnoux. In 2002, Jean-Marie Le Pen won 34% in the runoff (only 18% nationally). Even more spectacular was 2011, when the FN’s candidate took 51.5% of the votes in Carnoux (40.1% in the canton) in a two-way runoff against the incumbent NC general councillor. There might have been some first-round left-wing voters who voted against Sarkozy by voting FN in the runoff. Save for 2007 and 2011, the FN’s general range has been between 25% and 30%. In 2007, Jean-Marie Le Pen, as pointed out above, clearly lost many of his 2002 supporters to Sarkozy and lost more to abstention and the UMP in the subsequent legislative elections. The 2012 elections will prove interesting in the pied-noir community, and in Carnoux-en-Provence. 50 years later, the impact of France’s last colonial conflict still rears its head electorally. Posted on March 24, 2012, in Far-Right (FN etc), Fifth Republic (1958-), Regional analysis. Bookmark the permalink. 2 Comments.